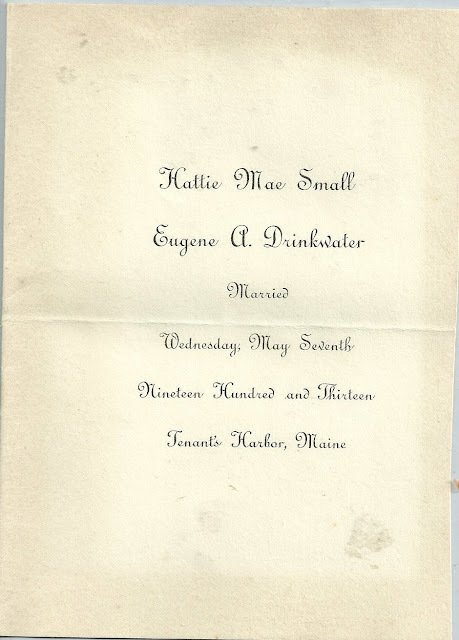 Wedding announcement for Hattie Mae Small & Eugene A. Drinkwater, married at Tenants Harbor, Maine, on May 7, 1913. Eugene A. Drinkwater, born about 1870, was the son of Daniel Drinkwater and Susan (Dennett) Drinkwater of Webster, Maine. It appears that Eugene married twice. On March 21, 1895 he married Statira A. Holbrook, born about 1878, daughter of Charles Holbrook and Abby (Tarr) Holbrook. Eugene and Statira had children Leslie; Richard; Charlotte; and Raymond. Statira died on July 12, 1912 at Webster, Maine. On May 7, 1913, Eugene married Hattie Mae Small. 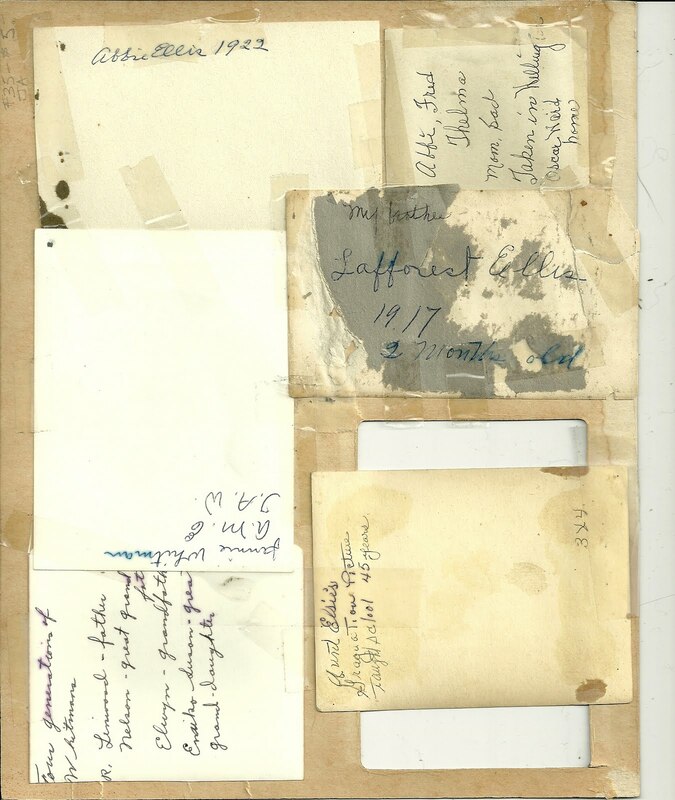 Hattie, the daughter of Harry Small and May (Bragg) Small, was born about 1892 at Vassalboro, Maine. Perhaps the wedding was held at Tenants Harbor because it's a scenic coastal location. The 1920 Census shows Eugene and Hattie living at Webster, Maine, with their son Edwin N. Drinkwater, born about 1915, and Eugene's son Raymond Drinkwater from his first marriage. Eugene died in 1928 and is buried with Statira in the Pleasant Hill Cemetery at Sabattus, Maine. Webster changed its name to Sabattus in 1971, in honor of an Anasagunticook Indian chief. If you have corrections to the information above, please leave a comment or contact me directly. 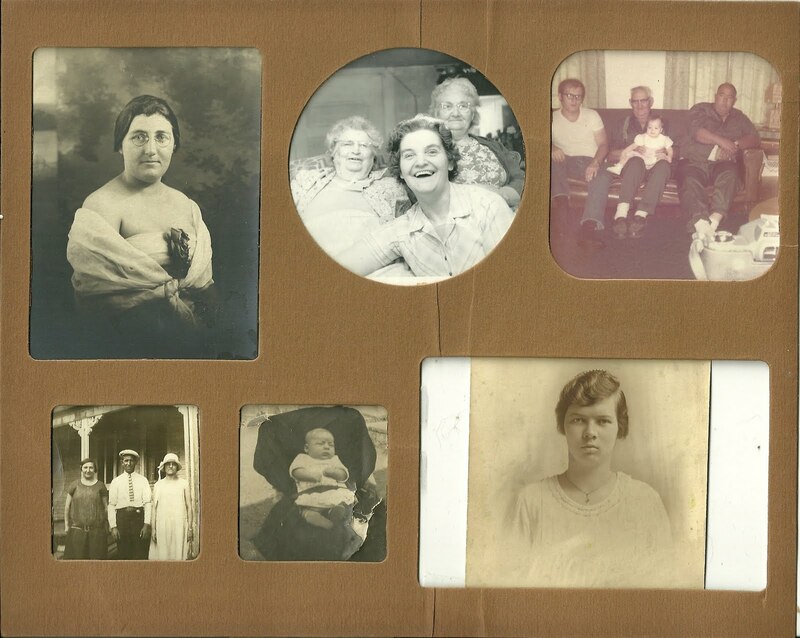 Collage of old snapshots of people in the Whitman family of Somerset County, Maine, including towns like Athens, Wellington, Solon, Harmony, Brighton, Norridgewock, Canaan, Mayfield, etc. There's a picture of Abbie Ellis in 1922. I believe this is Abby Whitman, sister of Nelson, who married Fred Almon Ellis. 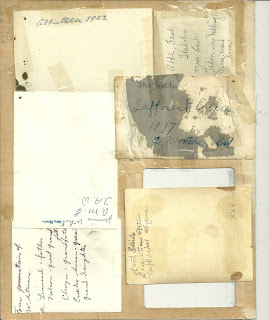 There's a picture of Abbie, Fred and Thelma, taken in Wellington at the Oscar Ward home. 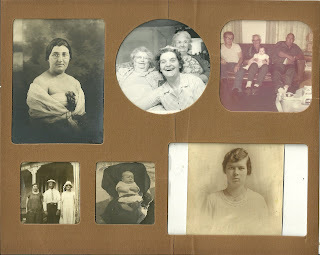 Finally, there's a picture of a middle aged woman and two older women with the ID: Jennie Whitman, A.M.E. and T.A.W. If you have any corrections, additions or insights to any of the information presented here, please leave a comment or contact me directly.